The PBC Council met last week and agreed to take a bit of a break this winter. That means that we will not be hosting Sangha Nights for a few weeks. Please check back or follow our Facebook Page to stay in to loop on when we start things up again. In this turbulent time, it is more important than ever to build and strengthen community. So how can the teachings of the Dharma help us do so? Please join Portland Buddhist Center on Tuesday, November 22nd to discuss the Four Sangraha Vastus, or the essentials of partnership. For those interested in learning about this topic prior to Tuesday, please click here for a Dharma Talk from Ratnaprabha. This meeting takes place in the upstairs classroom of the Naga Center (School of Traditional Thai Medicine and Massage), located at 4423 NE Tillamook St, Portland, OR 97213. Doors will lock at 7:00 pm when the mediation begins, so if you are running late, please give us a call to let us know. Has this election season challenged your serenity? Feeling like you need an energetic reboot? Join us on November 8th at 7pm for Meditation and a cleansing devotional practice dedicated to Padmasambhava. This has been a tense election year for our country. Let’s do something positive and unexpected instead of pacing in front of our TV’s! A Puja is a devotional practice which stems back to the ancient times of the Buddha when wandering forest monks would gather under the full moon to practice together. 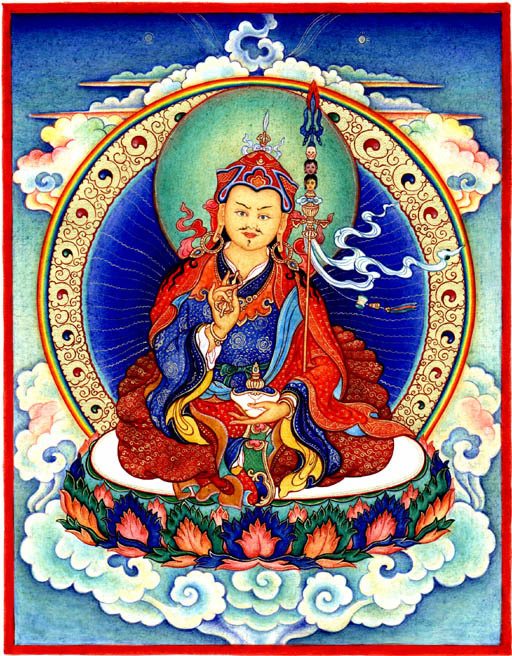 During this particular Puja, we will focus on Padmasambhava, the great Sage who brought Buddhism to Tibet from India. He is revered as the founder of the Nyingma school of Tibetan Buddhism and is thought to be a powerful conduit for Transformation. Note the clarity of Padmasambhava’s piercing gaze! Sitting in a posture of royal ease and wearing a wrathful grin, he subdues our demons with his right hand and holds a skull cup of amrit nectar in his left. His staff, or khatvanga, reminds us of the power of transformation, and the vulture feather in his cap symbolizes the bird who flies the highest. Doors open and 6:45pm and will be locked at 7:00pm. We will begin with a short meditation, then break for a brief tea and chat session after which we will begin the Sevenfold Puja. Join the Meetup Event by clicking here! I am sustained by perplexity; and I am here to destroy lust, anger and sloth. This course offers a practical introduction to the main forms of meditation practiced within the Triratna Buddhist Community and explains some of the concepts from Buddhism that underlie the practice. Sessions will include a guided mediation followed by a discussion based on readings from the book Change Your Mind by Paramananda. The cost of this series is $90. Books can be purchased in advance or at the first session for $10. To sign up for this class, please complete this form. To request a partial or full scholarship for this course, please complete this google form. The Dharma is a path that leads toward Enlightenment, but like all good road trips there are several points along the way. This week in our Dharma Life Skills Discussion we will pause to consider where we are now and where the next leg of the journey will take us! With reference to Vessantara’s talk “Entering the Mandala,” we will undertake the art project he describes around 30 minutes into his talk, by drawing our lives as Personal Mandalas. What is at the center of our lives? What is important to us? What do we spend a lot of time doing and thinking about currently? How integrated are our lives? Are there areas that are disconnected from each other? How does the central point of our Personal Mandalas hinder or support our practice? Does looking at our lives in these terms help us see something that we haven’t noticed before? After that we will think about whether there are any small changes we can make the journey toward Enlightenment a little more direct. Hopefully we will leave with a new perspective on our path and one helpful change to try out in the coming week. We hope to see you there on Tuesday, June 6th at 6:15 pm! If you haven’t heard Vessantara’s talk, you can find it on here on Free Buddhist Audio. If you want to learn more about the Mandala of the Five Buddhas referenced in his talk, there are several other Podcasts you can find by searching for you can find more resources by clicking here. This is a five week series of discussions to explore the Bodhisattva Ideal and how to apply it in our daily lives. The Bodhisattva Ideal is an exemplification of the altruistic dimension of spiritual practice. It involves a deep regard for the well being of others based on the understanding that there is no difference between “self” and “other”. The series begins with understanding the Bodhichitta otherwise known as the “awakened heart” or “will to enlightenment”. This will be followed by a Puja which is a devotional ceremony designed to awaken the heart. This will be followed by discussions of the six paramitas, the six perfections which are practices for developing the awakened heart. These practices are generosity, ethics, patience, energy, meditation, and wisdom. Classes begin with meditation at 6:15pm every Tuesday evening at the Naga Center 4423 NE Tillamook St.
February 24th: Understanding the Boddhichitta. While encouraged to attend both days, each day will also stand on its own. Suggested donation is $30/day. Everyone is welcome, regardless of the ability to pay. Meditation exercises the mind so that we are better able to work with mental and physical hindrances. The hindrances are natural human tendencies that can lead to suffering when they dominate our experience. These hindrances are hatred or ill-will; desire for sense experience; restlessness and anxiety; sloth and torpor; doubt and indecision. The techniques that we learn for working with these in meditation also serve us in daily life allowing us more freedom and creativity in our response to challenges.